Objective: Impediments limit dissemination and implementation of evidence-based interventions (EBIs), including lack of sufﬁcient training. One strategy to increase implementation of EBIs is the train-the-trainer (TTT) model. The Body Project is a peer-led body image program that reduces eating disorder (ED) risk factors. This study examined the effectiveness of a TTT model at reducing risk factors in Body Project participants. 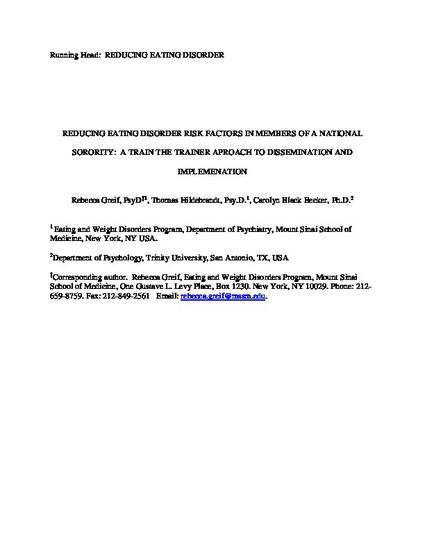 Speciﬁcally, this study examined whether a master trainer could train a novice trainer to train undergraduate peer leaders to administer the Body Project such that individuals who received the Body Project (i.e., participants) would evidence comparable outcomes to previous trials.We hypothesized that participants would evidence reductions in ED risk factors, with effect sizes similar to previous trials. Method: Utilizing a TTT model, a master trainer trained a novice trainer to train undergraduate peer leaders to administer the Body Project to undergraduate women. Undergraduate women aged 18 years or older who received the Body Project intervention participated in the trial and completed measures at baseline, post-treatment, and five-month follow-up. Primary outcomes included body dissatisfaction, thin ideal internalization, negative affect, and ED pathology. Results: Participants demonstrated significant reductions in thin ideal internalization, ED pathology and body dissatisfaction at post-treatment and 5-month follow-up. At 5 months, using three different strategies for managing missing data, effect sizes were larger or comparable to earlier trials for 3 out of 4 variables. Discussion: Results support a TTT model for Body Project implementation and the importance of utilizing sensitivity analyses for longitudinal datasets with missing data.